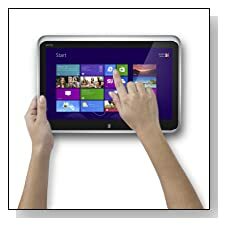 Dell XPS 12-5328CRBFB is an ultra book and tablet in one with snappy performance and power offered by the Ivy Bridge Intel i5 processor and the 128GB SSD. It turns to a 20mm thick tablet from ultrabook mode smoothly with a simple flip and fold movement in its modern flip-hinge design. While it offers all the functionality and flexibility in a great looking case, doesn’t give up on any of the main technical features such as processor, memory and storage or the graphics capabilities like many convertible ultra books in the market. Dell XPS 12 has a third generation Intel Core i5-3317U processor at 1.8 GHz, 4GB DDR3L SDRAM memory at 1600MHz, an all flash 128GB Solid State Drive with super fast boot-ups (also with Intel’s Rapid Start Technology) and faster and smoother functioning of everything and Windows 8- Home as the operating system which you should go online on Microsoft website and upgrade to the latest Windows 8.1 and its applications and customisable tiles will be even more fun to use with a touchscreen computer and tablet. It gives you the option to store your files in SkyDrive which instantly synchronises to Cloud to get access from whichever device at different locations. 4GB memory allows you to work on several apps, experience different multimedia at the same time smoothly and without delays. The bright bonded Corning Gorilla Glass 12.5 inch Full HD touchscreen display with 1920 x 1080 pixel resolution, 400-nit display offers sharp and clear picture quality with 170-degree viewing angle- much better visibility from any seat or part of the room and the high definition screen means you get to see things in much more detail. 400-nit makes working outdoors and very well lit rooms easier. The graphics card is the integrated Intel HD 4000, which is pretty standard but more than adequate for multimedia and most tasks including low end games but you need to look elsewhere if you wish to play the 3D games at higher settings. Sufficient quality sound is offered through stereo speakers and Waves Maxx Audio 4.0. Dell XPS 12-5328CRBFB is built with precision cut/machined aluminium and carbon fiber, so it is quite durable despite being light (3.4lbs) and slim (0.78 inches) due to use of the best materials. The flip hinge is tested for 20,000 cycles- 10 flips a day for 66 months. It comes with some top of the range features like Gorilla Glass screen that is resistant to bumps and scratches, light yet strong carbon fiber body and the backlit keyboard. One of the things that really stands out with this ultra book is the very long battery life that can compete with MacBooks: You can get up to 8.5 to 9 hours from its 47WHr 6-cell lithium ion battery. There is no Optical drive, no HDMI port nor a Media Card Reader but 802.11bgn wireless and USB 3.0 Bluetooth tied to wireless card, 2 x USB 3.0 Ports, a mini DisplayPort, a HD webcam with built-in microphone and a 3.5mm audio jack. Conclusion: Dell XPS 12-5328CRBFB is a compact yet capable convertible machine- tablet and ultra book in one with a Full HD very high resolution screen, a powerful Intel i5 processor, an ultra fast 128 GB SSD, a super long battery life for a Windows PC, a nice and comfy backlit keyboard with a responsive touchpad, a great design and a very solid build yet light with carbon fiber so it is very portable, durable, fast, powerful and good-looking. It doesn’t have many connectivity ports and not cheap but sure is well worth the money it costs, if it is something along the lines of what you’re looking for. 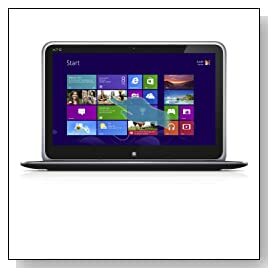 It comes with a 12 month manufacturer’s warranty and great customer service by Dell.